Maintenance jobs through online mode only. The official website for applying these jobs for application forms through online is www.hindustanpetroleum.com from 01-10-2018 onwards. The last date for submission of application form through online is 31-10-2018. The candidates will be selected based on merit in CBT test and skill test. 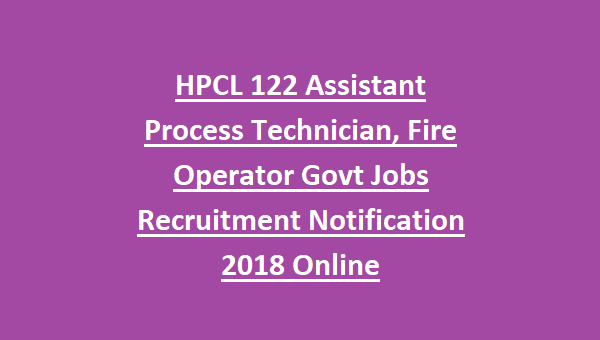 For other details of age limit, educational qualification, salary and how to apply are given below for the Assistant Laboratory, Fire Operator jobs in HPCL Recruitment Notification 2018. 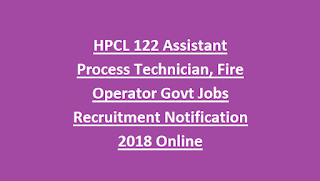 There are total 122 available vacancies for Assistant Process Technician, Assistant Laboratory, Fire Operator, Assistant Maintenance posts (non-management). As on 01-10-2018 the age limit for the candidates belongs to General/UR category is in between 18 – 25 years. 5 years upper age limit relaxation is applicable for the candidates belongs to SC/ST category. 3 years upper age limit relaxation is applicable for the candidates belongs to OBC-NC category. 10 years upper age limit relaxation is applicable for the candidates belongs to PWD category. 10 years upper age limit relaxation is applicable for the candidates belongs to PWD (OBC-NC) category. 15 years upper age limit relaxation is applicable for the candidates belongs to PWD (SC/ST) category. The education qualification based on post wise is given below. Assistant Process Technician – 60% marks in B. Sc. With Chemistry or Diploma in Chemical Engineering. Fire Operator – Intermediate/XII with science and Certificate in basic firefighting course for fireman from State Fire Training Centre. Assistant Maintenance Technician (Electrical) – 60% marks in Electrical Engineering Diploma. Assistant Maintenance Technician (Mechanical) – 60% marks in Mechanical Engineering Diploma. Assistant Maintenance Technician (Instrumentation) – 60% marks in Electrical Instrument Engineering Diploma. Assistant Boiler Technician – SSC with 1st class Boiler Attendant Competency Certificate. The salary offered for the selected candidates is for the non-management jobs in HPCL is Rs.47800/-. The Candidates will be shortlisted based on merit in computer based test and Skill test. Computer based test comprising of General Aptitude Test and Technical/Professional knowledge. The CBT test will be conducted at Mumbai. Candidates will be called for skill test on the basis of Category wise and based on merit in CBT test and finally selected candidates will call for document verification. Candidates can refer in the Official Notification for the details of exam pattern and syllabus. Interested candidates can apply through the online official website for non-management jobs in HPCL.The official website of HPCL for application form is http://www.hindustanpetroleum.com/ from 01-10-2018 onwards. The last date for submission of application form through online is 31-10-2018. For more information candidates check in the official notification.